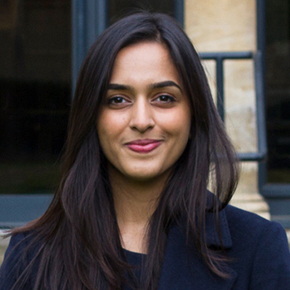 Navya graduated from Jindal Global Law School in August 2016. She has wanted to become a lawyer from a very young age and has had a diverse array of internship experiences in the Indian Law sector. After the BCL, Navya aspires to become a practitioner and legal academic in India in the area of public, energy and environmental law. ‘In the first semester of my undergraduate year, the first book I picked up was Cornelia Sorabji’s autobiography. To now be studying at her alma mater and on a Law programme in her name is very special to me. India’s first female lawyer and first female prime minister came from Somerville and to be part of that legacy of strong Indian women is something that is really encouraging and inspires me. I feel that India is at a stage where it needs intellectual leadership to inform the development of laws, particularly in the realm of renewable energy. Here, the energy-environment binary, as true in most developing countries, depicts a collision between aspirations of an ambitious government, anxieties of vulnerable groups and environmental concerns flagged by social agents. Law plays a balancing role in this chaotic paradigm.